Звёздный Путь: Фаза II (ранее известный как Звёздный Путь: Новые Путешествия) - это фанатский сериал, реанимирующий идею несостоявшегося продолжения Оригинального Сериала, повествующего о четвёртом годе пятилетней исследовательской миссии звездолёта Энтерпрайз! 0. "Come What May" (пилотный эпизод). Дата выхода: 16 января 2004 года. After receiving a distress call, the USS Enterprise, commanded by Captain James T. Kirk (James Cawley), is assigned to investigate an intruder attacking the Primus IV colony. Once there, the crew encounters a strange alien life form that can produce visions of personal events displaced in time. These visions may hold the key to better understanding the threat they are about to encounter. This pilot episode was a "test of concept" and is not considered one of the official episodes. 1. "In Harm's Way". Дата выхода: 8 октября 2004 года. The time stream was changed by sending a Doomsday Machine back in time. There, the Doomsday Machine destroyed several planets, manufactured more Doomsday Machines, and began what is now known as the Doomsday Wars. Captain Kirk, in command of the USS Farragut, is sent back in time to prevent this from happening and save the future. William Windom reprises his TOS role of Commodore Matthew Decker. 2. "To Serve All My Days". Дата выхода: 23 ноября 2006 года, улучшенная версия - 1 мая 2008 года. A group of Klingons are planning to expand their territory, but while the crew is doing everything in their power to stop the invaders, one famous lieutenant has to fight off his own demons when an old disease starts to age him at an alarming pace. Celebrating 40 years of Star Trek, Walter Koenig returns as Pavel Chekov, the USS Enterprise's best-known weapons officer. 3. "World Enough and Time". Дата выхода: 23 августа 2007 года. 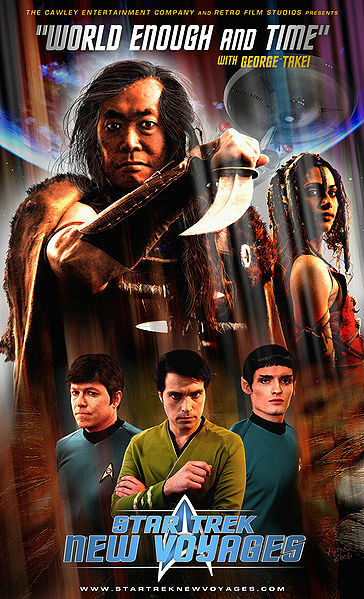 When a failed Romulan weapons test traps the Enterprise in an inter-dimensional rift, Sulu (Lim) and another crewmate are sent over to the wreckage of the Romulan ships. The anomaly's effect on the transporter causes Sulu (George Takei) to come back 30 years older... and with a daughter. World Enough and Time was the last episode to be released under the show's original title of Star Trek: New Voyages. 4. "Blood and Fire, Part 1". Дата выхода: 20 декабря 2008 года. Originally pitched to Star Trek: The Next Generation, this episode was turned down due to its controversial storyline dealing with homosexuality and AIDS. Original author Gerrold adapted it into a book, and Carlos Pedraza adapted it for the New Voyages crew. The episode marks the first appearance of Bobby Rice, formerly of Star Trek: Hidden Frontier. It is the first episode to be released under the show's new title of Star Trek: Phase II. 5. "Blood and Fire, Part 2". Дата выхода: 20 ноября 2009 года. Originally pitched to Star Trek: The Next Generation, this episode was turned down due to its controversial storyline dealing with homosexuality and AIDS. Original author Gerrold adapted it into a book, and Carlos Pedraza adapted it for the New Voyages crew. The episode will guest star Bobby Rice of Star Trek: Hidden Frontier. 6. "Enemy: Starfleet". Планируемая дата выхода: 2011 год. This episode comes from a story by Dave Galanter and Greg Brodeur. It takes place partly on an alien planet, with location shooting and principal photography in New York. 7. "The Child". Статус: пост-продакшн. Originally a script for Star Trek: Phase II in 1977 and later reworked into the first episode of the second season of Star Trek: The Next Generation. Now being developed as it was originally written. 8. "Kitumba". Статус: пост-продакшн (заканчивается стадия наложения спец.эффектов). Originally a two-part story draft for Star Trek: Phase II in 1977, it was rewritten into a one part episode for this production. A good deal of the episode takes place on Qo'nos, the Klingon homeworld: which was shot on location at Fort Ticonderoga, NY, and at a local restaurant. Members of the International Klingon Federation helped out with the location shoots. 9 & 10. "Origins". Статус: пост-продакшн. An episode that goes back to the beginning and explores James T. Kirk's life as a cadet and shows how his adventures all began! Based on the classic fan-fiction story, this episode is being adapted from the original story for the production at the request of Ms. Maiewski prior to her death in 2004. An edited version of the story appeared in Star Trek: The New Voyages, a Bantam Book series, but Maiewski was unhappy with the edits. An episode that has been compared to The Trouble With Tribbles, but is much darker in tone. This story has previously been adapted into Star Trek: The Manga and is currently being adapted for this production.